We had a great debate at the Financial Services Club last night between digital money sage Dave Birch of Consult Hyperion, and all things bitcoin master Jon Matonis. The debate was about whether blockchain is faster and cheaper, and it was clear from the start that this was going to be difficult as the question Dave raised is: faster and cheaper than what? I’ll talk more about the debate in further posts but, to begin with, it is clear that there are raging arguments taking place in the corridors of banks about this technology. For me, it appears that the arguments are about Blockchain because it has become as numb a word as Cloud and Big Data. Blockchain, Cloud and Big Data mean little, and are just amorphous buckets to throw lots of things into. When you look under the hood of the bucket terminology, you find lots of interesting things, but the arguments in banks are about the bucket itself. We need to be in the bucket, says the bank’s CIO. What’s in the bucket, says the bank’s CEO. The next generation of banking tech, says the CIO. Oh, in which case, here’s a few squillion bucks to make sure we are part of the next generation of banking, says the CEO. Neither know nor have a clue what blockchain is, they just know they need to be in it. Then the CIO goes back to the tech offices and digs out the coolest looking guy in the office under the age of 35. Hey, you’re a millennial, he says. I am, says the cool guy. Find out what this bucket stuff is all about. You’ve got the job. CIO walks away and cool guy goes, WTF? A month or two later, cool guy comes back to CIO and says, I’ve discovered that there are over 10,000 use cases for this bucket stuff and 1,000 start-up companies are developing proofs of concept. Look, says CIO, I don’t need to know the detail. Just make sure we’re working with the right ones. Cool guy goes away and starts building his knowledge bank, contacts and network in the hot new space of the bucket world. Soon he is the go-to guy for everyone and has become The Guru. But it’s purely because no one could be bothered looking under the hood of the bucket, or in this case blockchain, and discovering what’s really going on. When you do look under the hood, it’s pretty complicated. You have public blockchain systems and private blockchain systems. You have permissioned and permissionless systems. You have shared, distributed, federated ledgers and the bitcoin blockchain. For most bank leaders, this is like learning a foreign language and, for most bank leaders, they don’t have the learning ability to keep up. 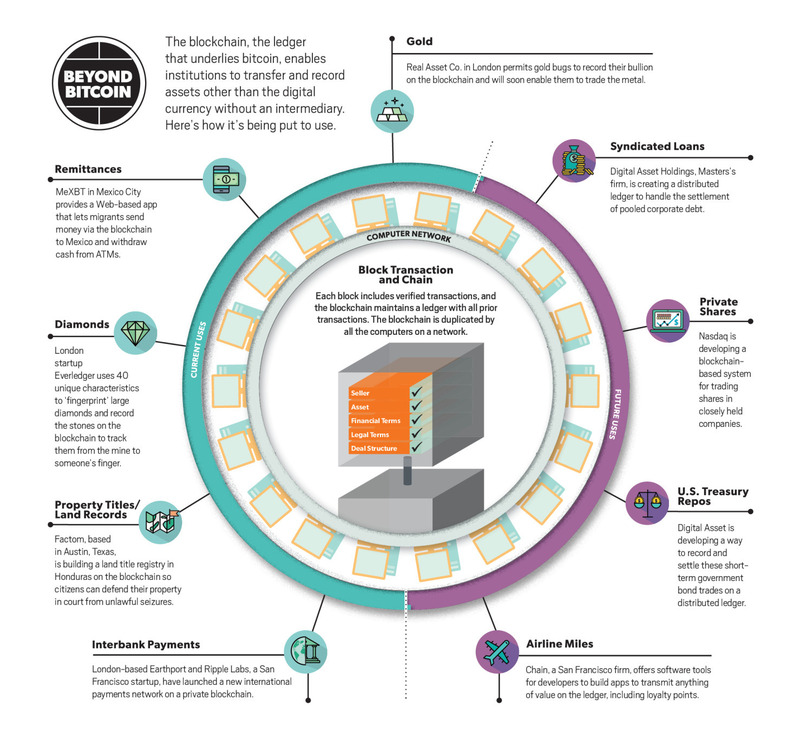 So, if you’re a banker reading this and have no idea what’s under the hood, here are three of my favourite infographics about blockchain that I think show what’s going on really well. And then this third one, and my favourite (from First Partner), shows the intricate detail of what’s happening in banking and finance with blockchain (download zip file). This shows how complicated but also exciting shared ledger developments are, and the fact that there are so many firms building on this technology demonstrates there is something serious happening here. My take away is that blockchain and shared ledgers are using interchangeably, but they are not the same. Blockchain is usually associated with Bitcoin, whereas shared ledgers are a different possibility for private ledger developments. Equally, cryptocurrency and digital currency are used interchangeably, but they are also not the same. A cryptocurrency is often a pseudo currency like bitcoin whilst a digital currency could be euros or dollars on a private shared ledger. What this demonstrates is that high-level scratching the surface of blockchain ledgers won’t do. However, for those who do want to talk high level, just remember that blockchain does not necessarily mean bitcoin or technology per se, but it’s about the granularity of use cases that apply to all aspects of finance and governance. As Dee Hock, founder of Visa, says: “it’s not just about the future of finance, but the future of governance”. And remember that you can delegate the research and activities in this space, but if you’re not intimate with the applications and benefits, then you might as well be dealing with weapons of mass destruction without knowing that it’s your finger on the button.